Recorded: Live at Palais des Sports, Paris, France 3rd May 1982. Comments: From European 'Hot Space Tour 1982'. Info I have got, say's great sound quality. 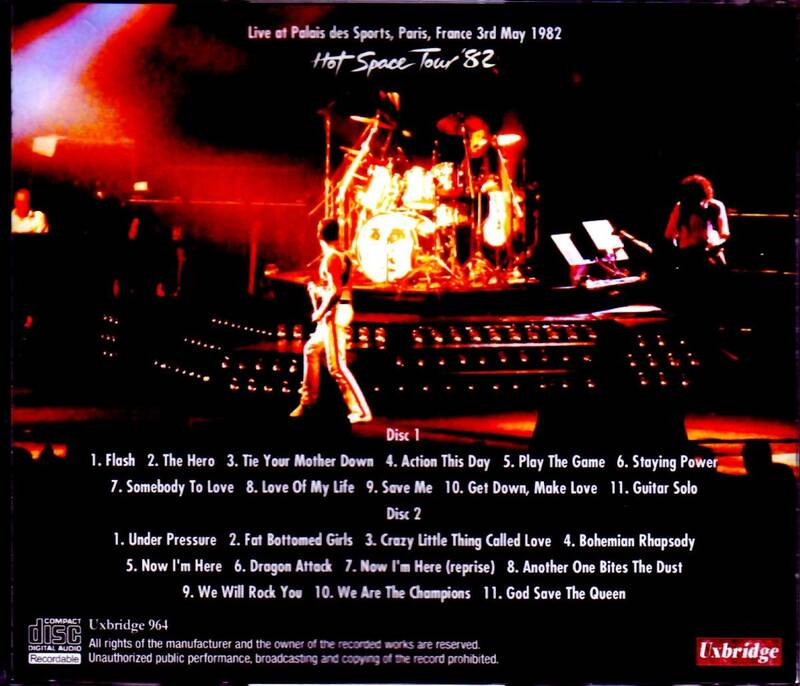 As the title of the album, a 1982 European tour where a stage like the universe appeared like every evening. From this point of view, this time is the Queen's live peak season, and the performance is amazingly high in all performances. For example, 1982 Europe with queen like the same period as 1970 in Led Zeppelin, or 1973 in Rolling Stones. The album "HOT SPACE", which tends to be said to be a major failure on the commercial side, has now been completely re-evaluated and it has been recognized that it was a wonderful work. Because it is a time when you culminate as a live band, so if you are a maniac I would like to hear any performances ... certainly Frankfurt and Vienna released on a limited press CD were the best, but that's high level It is a time to let me hear the performance, so even if the sound quality drops a bit, I would like to ask other performances as well. The European tour of 1982 is getting endorable support from so much mania. So we will release a rare Paris performance on 3rd May as a CD-R item on UXBRIDGE label this time. In the past, this sound source had CD-R items "PLAY AT PARIS", but I used an unknown sound source, and I heard that the sound quality with originally gritty impression is even more fancy . But this time it is based on Second Generation · Copy, and it became possible to enjoy it in a quite stable state coupled with accurate pitch. Also the state of recording is excellent and the volume up and down as if switching recording modes of the recorder many times in the latter part of "Tie Your Mother Down" and the guitar solo of "Bohemian Rhapsody" and the end of "Another One Bites The Dust" Although it will occur, the cut of the recording that ran into the performance itself is a splendid thing that is only Brian's guitar solo time. It is good that the sound image will be easy to hear as it gets closer to "Somebody To Love". And of course, it is wonderful like this is the performance of the day. It is brilliant because in Europe 's 82 years Freddie stands out with the band pulling guigui and it is sharp and tired. Freddie is doing great from the opening though it is not pushing mood as much as Frankfurt a few days ago released at press CD "FRANKFURT 1982". Depending on the mania some people say that people who likes this are better than Frankfurt which was a high tension tension. Anyway, Freddie's tension is tremendous, so when listening with audiences recording, you can see that the people in Paris are totally overwhelmed. In the call and response after having finished "Love Of My Life" by everyone, Freddie is flying too much and the audience can not keep up with it. A wonderful live that can run through to the end without such violent voltage remaining. Between 'Now I'm Here' sandwiching 'Dragon Attack' Freddie is not tired and fly away. It is certain that it is a sound source for maniacs as it is issued with CD - R. It is a level of sound quality that does not actually reach Frankfurt or Vienna. However, it is also fact that it is an audience recording which can be enjoyed affordably if it is a mania. At the same time, it is a factor that made this release realize, and the wonderful performance contents which the high point unique to the 1982 European tour so far went down to everywhere is magnificent. 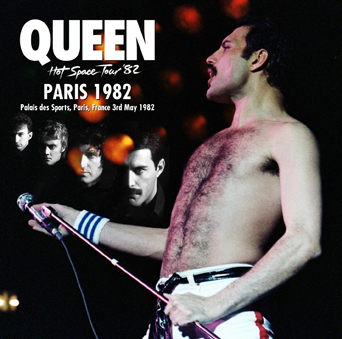 We will dedicate this title to the faniest mania who love the "HOT SPACE" show in Europe at the height of Queen's live at the height of the live performance, 82 years in Europe.